Description: The project is devoted to the creation of the full dynamic model of real-time of Anastasievskaja GLKS. Address: Current DB into the SVN-repository, DB in file: AGLKS.tlz. Anastasievskaya GLKS (AGLKS) is the technological process designed for two-stage gas compression of gas fields. For this purpose GLKS is provided with six centrifugal compressors: three compressor for low and high pressure part, thus providing redundancy and allowing the parallel operation. To test the control algorithms of GLKS, especially anti surging algorithms the creation of mathematical model of GLKS was required. The model must run on the single board computer with the PCI and communicate with the controller of the technological process control. For development of the model it was used library of technological devices of OpenSCADA. 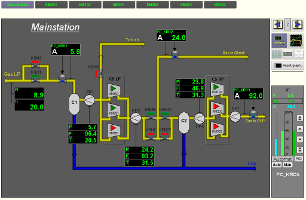 Subsequently, the TP model of the compressor station has grown into an autonomous system which is used in the OpenSCADA project as the demonstration of features and capabilities. Before creating the GLKS model, it was created the principle circuit of the model of technological process, based on the principle circuit of the real process. The resulting scheme is shown in Figure 1. Figure 1. Principle scheme of the AGLKS model. To construct the model of technological process on the basis of the available models of tech. devices it was directly used the source principle scheme and block calculator (BlockCalc) of the OpenSCADA system. The technological devices added to the block scheme in accordance to the principle scheme. 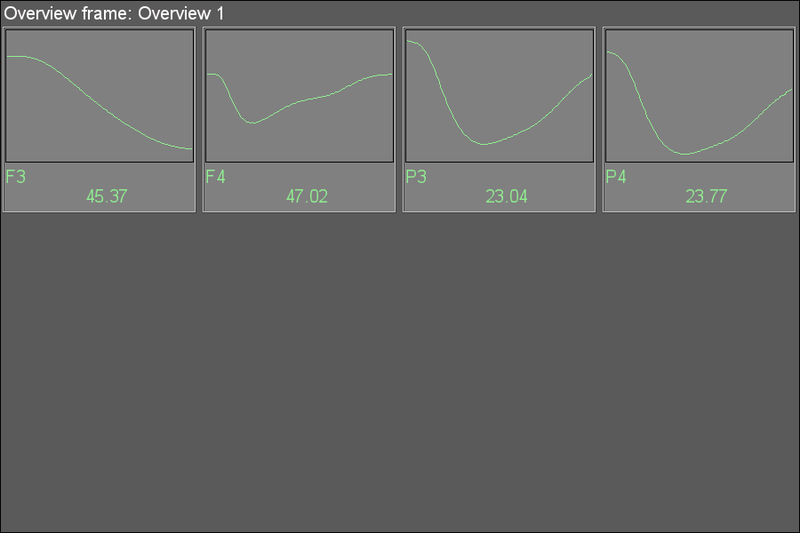 Several blocks were added as the accessory ones and for the nodes of the flows. The numbers of the nodes' blocks are indicated on the principle scheme near the flows nodes. The model is implemented as an eight-block schemes of the block calculator. Structure and properties of block schemes are shown in Table 1. From the characteristics of block schemes can be seen that the capacity of the model as a whole to the CPU Athlon 64 3000+ (2000MHz) is 19.5%. Table 2. lists the models being used in accordance with the principle scheme. Through the using of the library of the models of tech. devices and concepts for building the dynamic models it has been obtained the dynamic model, from which you can get the parameters at any point of the principle scheme as for the study and for testing of the control algorithms. 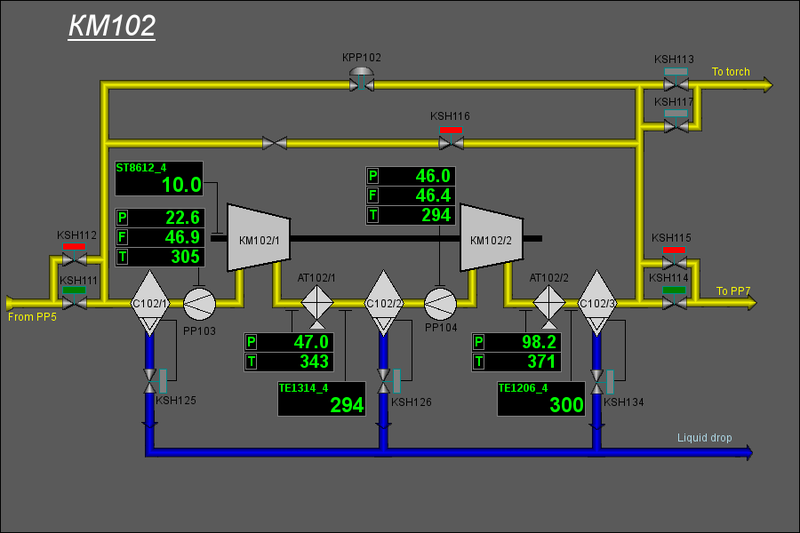 In the model of the control system of the mainstation part there are three PID: PC_KRD1, PC_KRD2 and PC_KRD3 to regulate the pressure at the input of the CS, between the compressors of low and high pressure, as well as at the output of the CS. To obtain the information on the technological process the parameters of TP (Table 3) were created, which represent data from individual nodes of the model. User interface of the model is represented by seven signaling objects (Fig. 2). 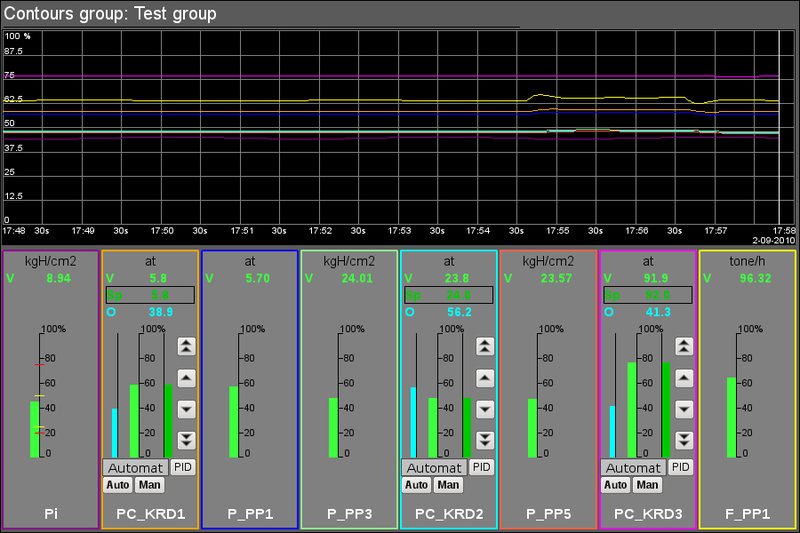 Six of them contain frames of the compressors KM101, KM201, KM301, KM102, KM202 and KM302. The seventh is common for the entire compressor station and contains mainstation frames. Mainsttion signaling group includes two mnemonic scheme, two groups of graphs, a group of contours, an overview frame and five documents. Fig.2. 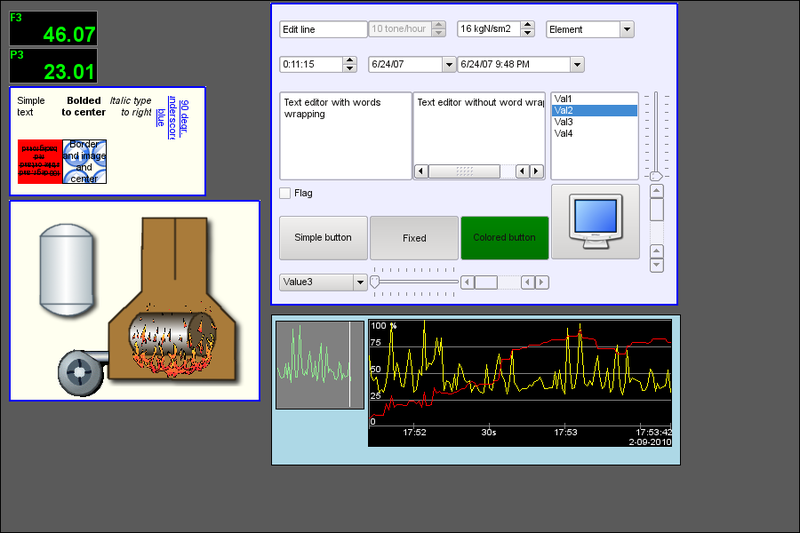 General view of the user interface window. The mnemonic schemes of the signaling object "Mainstation" are resented in Figure 3 and Figure 4. 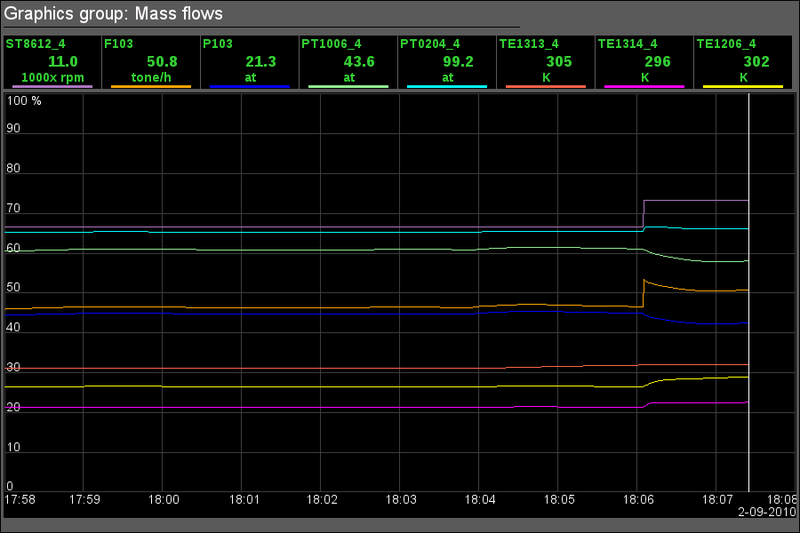 Graphics groups "Mass flows" and "Temperatures" are presented at Fig.5 and Fig.6 respectively. Fig.5. Graphics group "Mass flows"
Contours group "Test group" (Fig. 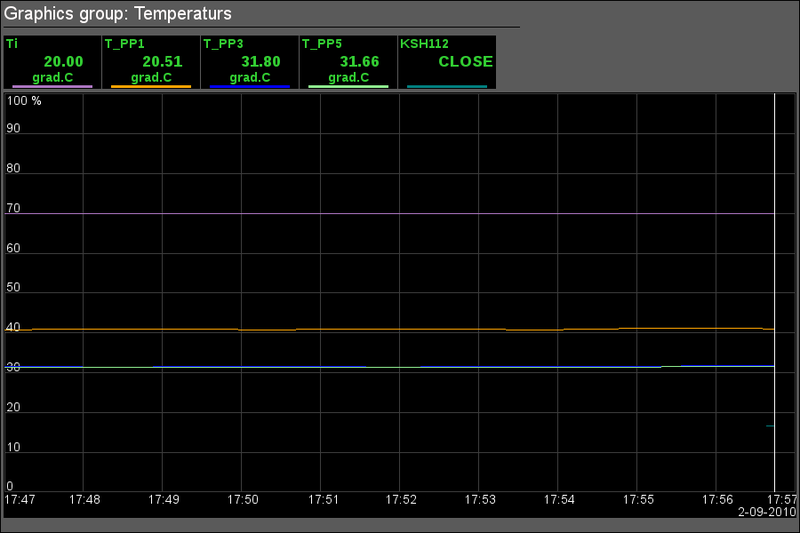 7) contains the contours of all the regulators and a set of important parameters. Fig.7. Contours group "Test group". Group of the overview frames "Overview 1"(Fig. 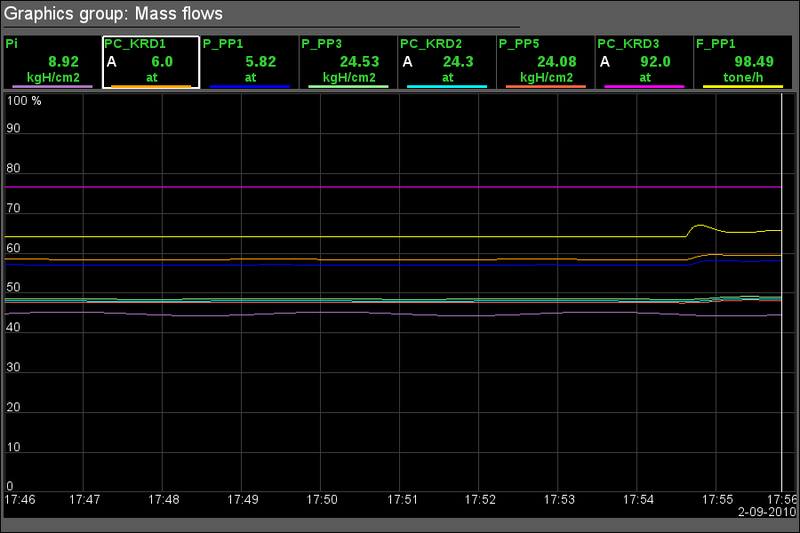 8) contains the frames of main parameters. Fig.8. Group of the overview frames "Overview 1". 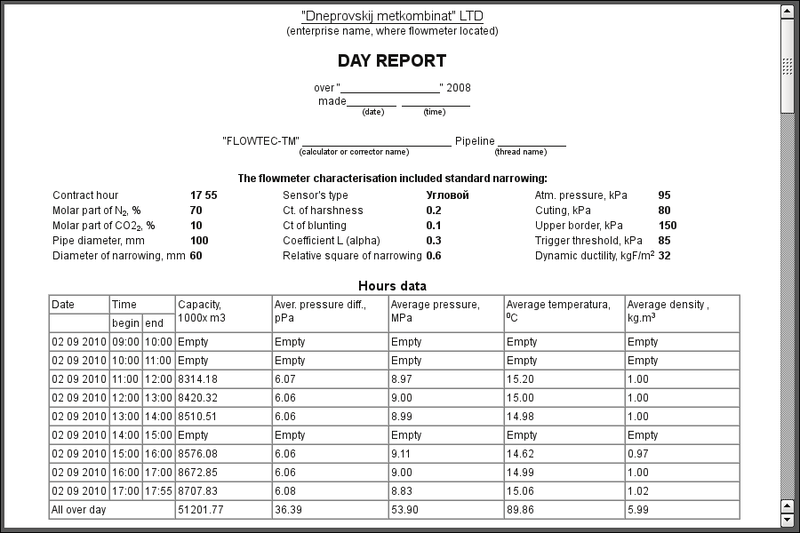 The documents "Table of accumulation instantaneous values", "Log of interruptions", "Table of average over hour values", "Table of average over day values" and "Day Report" are presented in Fig.9, Fig.10, Fig.11, Fig.12 and Fig.13 respectively. Fig.9. 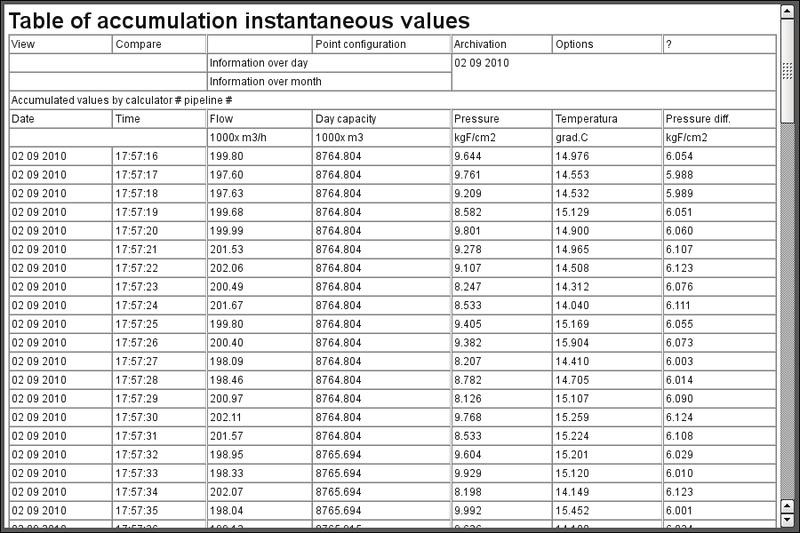 The document "Table of accumulation instantaneous values". Fig.10. 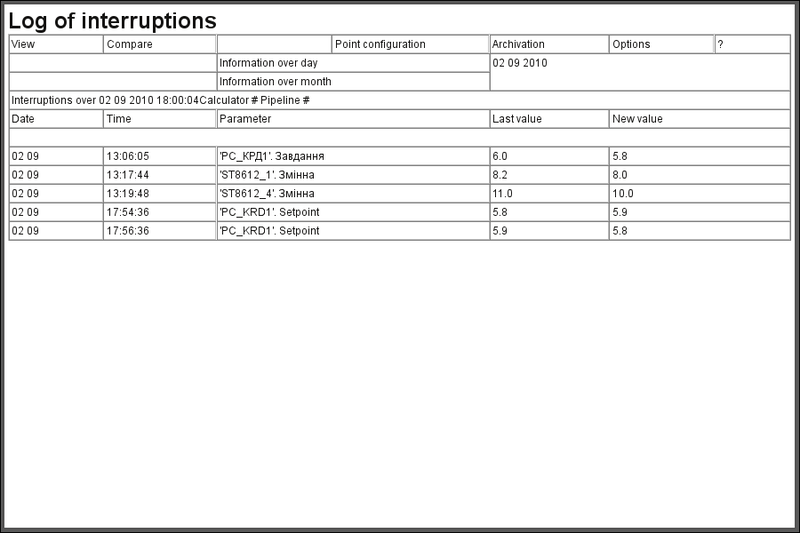 The document "Log of interruptions". Fig.11. 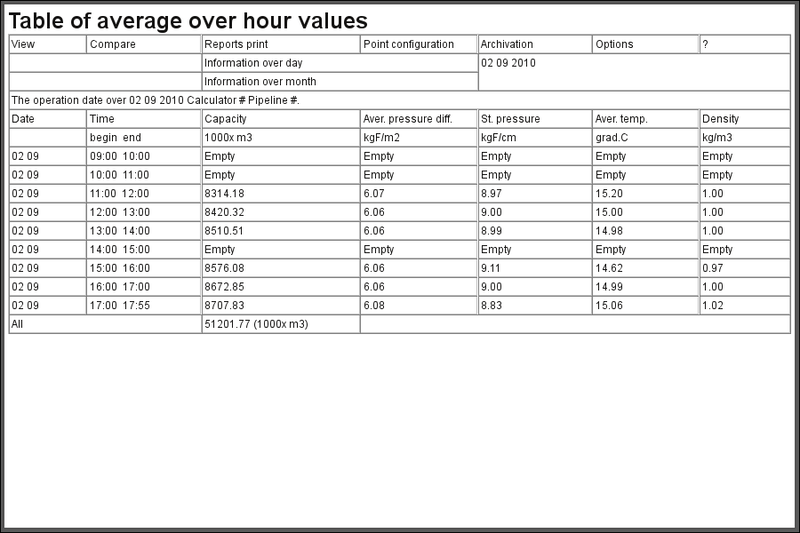 The document "Table of average over hour values". Fig.12. 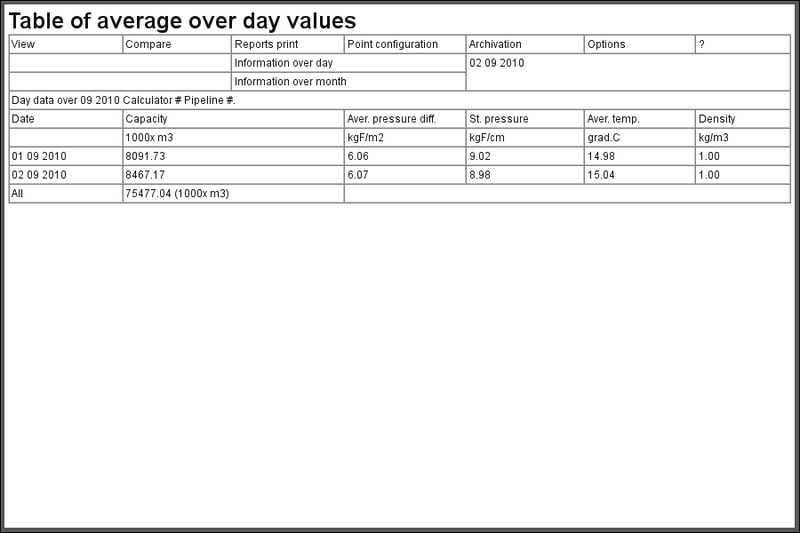 The document "Table of average over day values". Fig.13. The document "Day Report". Signaling objects of the compressors of low pressure contain mnemonic scheme (Fig.14) and graphics group (Fig.15). Fig.14. Mnemonic scheme of the low pressure compressor. Signaling objects of the high pressure compressors include mnemonic scheme (Fig.16) and graphics group (Fig.17). Fig.16. Mnemonic scheme of the high pressure compressor. Fig.18. The result graphics "Page 1". 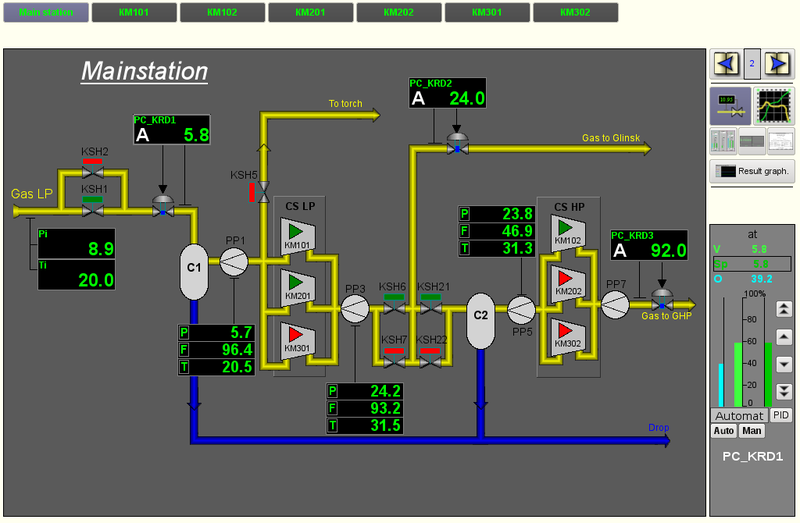 The result of the development is the complete dynamic model of technological process of the compressor station. 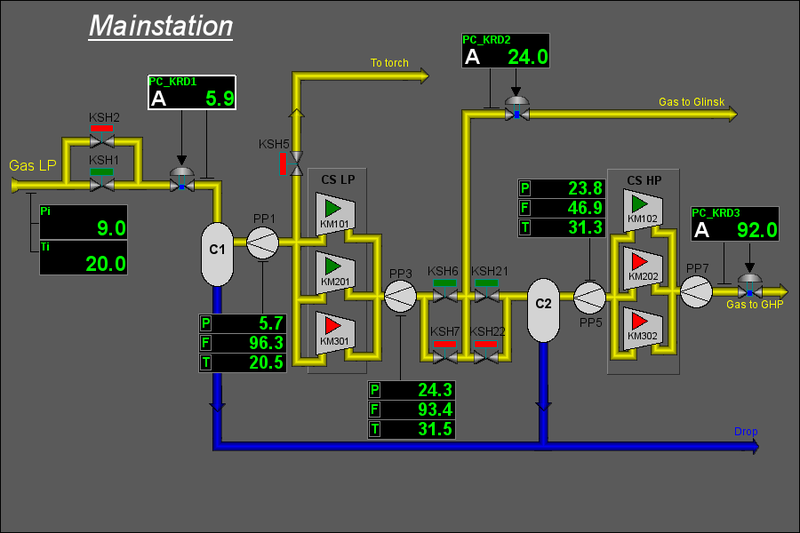 This model is available in three languages and is included in the distributions of OpenSCADA as the demonstration of features and capabilities. 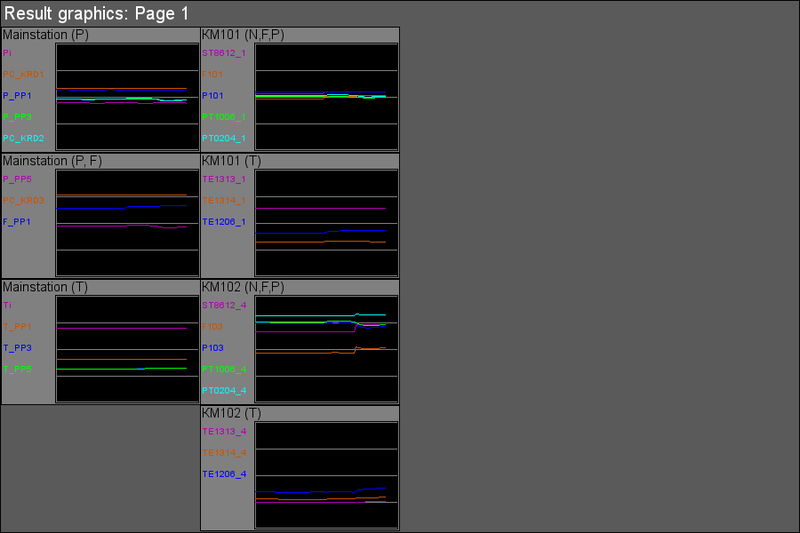 manual input of the values of rotations (ST8612) and the positions of the antistall valves (KPPx0x). The model was successfully applied for debugging algorithms of antistall protection of the compressors of Anastasievskaja GLKS. 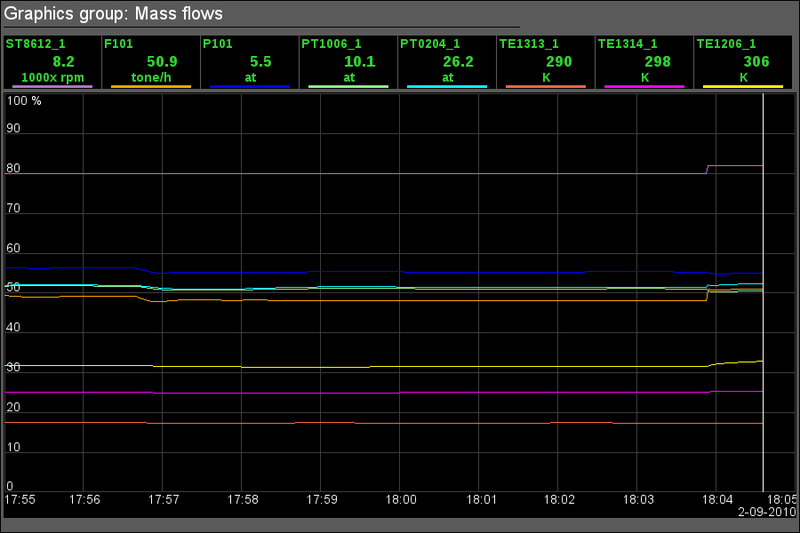 Resource intensity of the model was 70% on the core processor 800 MHz.